He was born and grew up in Sheffield, educated at Marlborough, and when he left he took a job at Sotheby’s. It was here that he quickly revealed his impressively sharp eye for detail and perspicacity and he quickly rose through the ranks and became an authority on antiquities and the Impressionists. In this capacity, he traveled widely for business purposes. After a few years, however, he was forced to stop because he developed problems with his sight. His doctor, Patrick Trevor-Roper, advised him to “open his horizons” and Chatwin followed his advice to the letter, traveling all over the world, studying customs and ways of thinking and recording them. For a time, he felt drawn to university life and enrolled at Edinburgh to study archaeology, considering himself an “architectural intellectual”. But this involvement lasted no more than two and a half years either. Thereafter he devoted his time exclusively to traveling, writing and his unstable personal life. His narrative style has been thought to rival that of the great American author Ernest Hemingway and for many he’s the most important modern travel writer. It was said, in fact that he was capable of compressing whole worlds within the pages of his works. Initially he disliked Greece and took every opportunity to say so. Later he got to know the country and became a frequent visitor. He stayed at the house of his friend and fellow writer Patrick (Paddy) Leigh Fermor († 2011) in Kardamyli in Mani. In 1985, while he was in Greece working feverishly on a book, he interrupted what he was doing and paid a visit to the Holy Mountain. He must already have had some knowledge of the Mountain from the art critic Robert Byron (1905-1941), author of The Station, one of the best books available in English about the Holy Mountain. For Byron, the wall-paintings on the Holy Mountain were the best in the world. Chatwin respected Byron’s work greatly and his personal questioning may well have been shaped by it. From as early as 1980, he’d begun to pester his close friends, James Lees-Milne (architectural historian) and Derek Hill (painter) who were regular visitors to the Athonite state, to take him with them. Lees-Milne, whom he asked first, was completely opposed. Chatwin then turned to Hill, who knew Nikanor, the former abbot of Hilandar (the monastery was still idiorrythmic at the time), and who had already visited the Holy Mountain some 25 times. 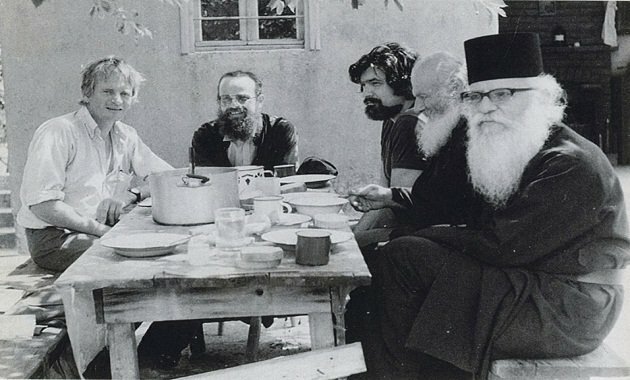 Hill acceded to Chatwin’s request, albeit reluctantly, since he was far from certain how his idiosyncratic nature would respond to the Athonite monks and their way of life. They finally visited the Holy Mountain in May 1985, although others claim that he was accompanied by Leigh-Fermor on the visit. The writer was greatly taken by the Mountain. In fact, during his visit to one monastery he became cross with some Greek visitors who were speaking loudly during a service and preventing him from concentrating. 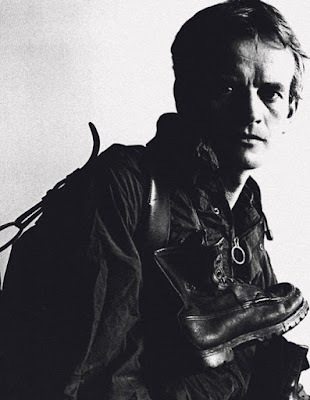 Bruce Chatwin (l.), Fr. Luke Majoros (c.) and Fr. Mitrofan (r.), both from Hilandar. It was a journey that would radically alter Chatwin’s life. After his death, it was rumored among his circles that he “had found God” there. However that may be, it was clear on his return to London that he had been greatly affected, although he preferred not to go into detail. In any case, his acquaintances called this journey the most “mysterious”. Before then he had barely been interested in the metaphysical. His wife, Elizabeth Chandler, was Roman Catholic and before their marriage in 1965 he had had instruction about the basic faith and practices of that Church from a Jesuit in London. But when they later moved to the USA, he was given a leaflet from Elizabeth’s parish. The content bothered him greatly: it explained that a Roman Catholic should not marry anyone of another dogma or religion. This clashed directly with his “nomad” outlook. From then on he began to believe that only those who were permanently settled in a particular spot could be interested in religion. But he was never really free of metaphysical questions. At one point, in a note, he remarked that the study of nomads was a search for God. Somewhere else he noted that religion is a technique for getting to your death, at the right time. In all probability, it would have been during his illness that he turned to the metaphysical. While recuperating with Elizabeth in Nepal, his thoughts had turned to a man’s Athos “in the Greek sense of abode or dwelling place – the root of all his behavior for good or bad, his character, everything that pertained to him”. His relatives brought his ashes to Kardamyli, to the Byzantine chapel he loved, which dated from the 10th century and was dedicated to Saint Nicholas. When he first saw the spot, Chatwin observed: “The Greeks have always kept the best places for God”.